THOUSANDS OF PEOPLE around Berlin’s central railway station were evacuated today to allow disposal experts to defuse an unexploded World War II explosive unearthed on a building site. Trains, trams and buses were halted or rerouted for the operation to dispose of the British 500-kilogramme bomb found more than 70 years after the war. Authorities declared an exclusion zone with an 800-metre radius around the site located just north of the central railway station, a transport hub that on a normal day is used by 300,000 passengers. Police finally gave the all-clear at around 1.30 pm (12.30pm Irish time) after experts successfully disabled the bomb. The temporary exclusion zone covered the train station, an army hospital, the economy ministry, an art gallery and a museum as well as part of the BND intelligence service’s new headquarters. Many thousands of residents and employees were ordered to stay away until the all-clear was given. Among them were workers at the economy ministry who were told to work from other offices or from home, or were simply given the day off, a spokeswoman said. Police also went house to house to check the zone was completely cleared before the bomb disposal experts began their work. Temporary shelters were set up for those affected by the evacuation. Esen Coskon, 50, who took refuge in one of the shelters with his 22-year-old son, Furkan, said he learnt of the evacuation from the media and police, who had sent leaflets to every home. Coskon said he had a feeling of deja vu, recalling a similar operation in 2013 which also affected the area around the main railway station. “Everything has been well organised… we were told to leave our apartment at 9:00 am. The police came to knock on every door,” he told AFP. Angela Merkel’s chancellery building and the Reichstag lie just a few hundred metres to the south of the no-go zone and can keep operating as usual. 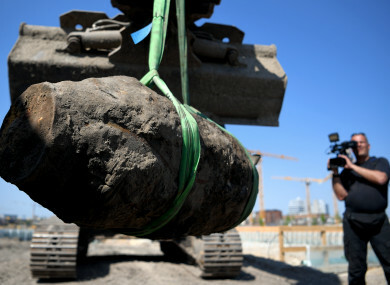 In the biggest post-war evacuation, at least 60,000 Frankfurt residents were forced to leave their homes last September so that an unexploded 1.8-tonne British bomb dubbed the “blockbuster” could be defused. Some 3,000 such unexploded bombs are believed to still lie buried in Berlin, a city of three million people, where disposal squads are well-practised in defusing them and other ordnance. The latest bomb was found during construction work on Heidestrasse in the district of Mitte. “We’re talking here about a bomb that measures about 110 by 45 centimetres, so it’s a hefty heavyweight blaster with the potential to cause severe damage in the centre of town; that’s why we are going about it very very carefully,” said police spokesman Winfrid Wenzel. Email “Pictures: Disposal of massive WWII bomb causes mass evacuation in Berlin”. Feedback on “Pictures: Disposal of massive WWII bomb causes mass evacuation in Berlin”.